These days, you can expect to pay significantly less, with good, working models as cheap as $10 at swap meets and not much more online at sites like eBay. While they seem primitive by today's modern instant camera standards - no built-in flash for example - the SX-70 still takes gorgeous, beautiful pictures in good light and besides, it boasts some of the coolest style you'll ever find in any camera with its faux-leather binding, chrome trim and of course, pop-out design. I was turned onto the SX-70 by "Cool" Chris Veltri who runs Groove Merchant Records in S.F. I was a little skeptical at first, but quickly fell in love with the camera's unique charms. Even it's limitations have proven to be assets in taking remarkable pictures. For example, the main photographic limitation with the camera is how it performs in low light situations sans flash (by the way, flash bulbs are available if you want them). The exposure control automatically keeps the shutter open until the film has received enough light to process, but unless you've got it on a tripod (which you'll need an adapter for anyways), expect a ton of motion blur plus an oversaturation of whatever light sources exist within the frame. The upshot is that you can create some fantastic images in the process, like the self-portrait you see at left, the result of a bright neon sign and long exposure, plus tons of blur. The main drawback to the SX-70 is the cost of the special Time-Zero film that the camera requires. At least Polaroid still keeps it in production, but most places, you can expect to pay $15 for a 10-pack, and that's assuming you can even find it to begin with. Still, Polaroid's offer something that few cameras - save digitals - can offer: instant gratification and unlike digitals, the finished photo is instantly tangible from the second it spits out of the camera. IMPORTANT: If possible, try not to use outdated Time-Zero film (each pack should be stamped with an expiration date. I've used some that were about six months old and that was ok, but I recently bought 10 packs of film that were over a year old and it was a disaster. What happened to ALL of them was that the seams were cracked, allowing emulsion to leak out when the film was processed through the camera. The emulsion is corrosive and will not only eat through the photograph, but also your fingers. This can be accurately described as a very bad thing. It's not like your skin will begin to melt, but the emulsion will give you blisters. Bad, very bad. Just make sure if you buy Time-Zero off eBay or something that you ask what the exp. date is. If the film has been stored in a cool environment, then you may be able to gamble if it's less than a year past, but otherwise, I wouldn't risk it. Thanks for the info. I was just "handed down" a polaroid sx-70 and this was very helpful. Great info! I just got one in mint condition from my grandma. I just bought a sx-70 with no idea what is was for 15 bucks. it looked like an oversized flask with a clip. its very cool looking! I havent looked very hard for film yet, and i am afraid of ebay, so could you suggest any local dealers in the Bay Area? im in the east bay. thanks alot!!! i just bought an sx-70 with no idea what is was, in fact, i was attracted to it at a flea marked because it looked like an oversized zippo lighter. anyway, i havent looked too hard to find any film yet, and i am afraid of ebay, so could you suggest some possible vendors in the east bay or greater bay area? i would really appreciate it! Excellent photography. I like this type of abstract images. Greetings from Spain. Nice site. Very informative. Can you tell me if the auto focus models are worth repairing? PS Your daughter is one cute kid! Since we can't find films anymore... if somebody want to sell me his sx-70 (exhibit for a photography lesson > better if it's working), it would be very nice! hey check out this artists that does hand altered polaroids. it is pretty awesome and i think i'm gonna try that just for fun. I need some helpful tips on this camera. I hope you check this and this is not too old of a blog. I need to know what you do about the exposure since the only film really that can be used is 600. What do you do as far as all the light? i taped some plastic over the lens and have the exposure all the way down as well as shoot with the sun( behind me ) and its still bright.. Please help me out, your photos are beautiful. i love the old sx70, have been using them for years since i found one in a second hand store and was seduced by its sheer beauty (shoosh, i know that sounds wanky!). i have had very little trouble converting my land camera to polaroid 600 film, i'm not sure if you all know this as have not properly read through comments, but all is simple: when inserting 600 film, instead of burning off tags on bottom of film pack, slide a firm but flat object under the film pack until it goes in smoothly. i suggest using the blackout card the pops out of your last lot of polaroid film. 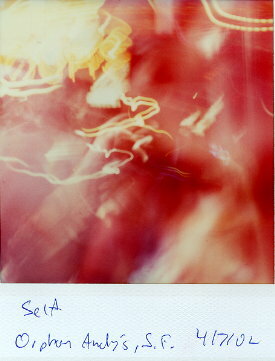 next: looking at mr. sx70 face on, there are three objects. first on left, shutter; in middle, lens; and on right your exposure lens and meter. on exposure lens, remove small silver ring on outside (lever it off with sharp knife or such) remove existing filter(just a piece of plastic that is slightly shaded) and replace this filter with a piece of clear plastic, i found simple old acetate works). third, you are also advised to insert a medium density 2 filter. i didn't, and am probably losing a bit of colour and detail, but i like it that way. it's up to you. this whole operation (including cutting acetate to size) should cost you five minutes. FINALLY, DONT FORGET TO ALWAYS SET YOUR SX70 TO LOWEST EXPOSURE UNDER THESE NEW CONDITIONS!!! sorry to shout, but film is expensive, matey! i would advise getting a medium density 2 filter, i like it without, but you might not!!! finally, rejoice in the fact that this beautiful mechanism is still alive and well and needn't collect dust! 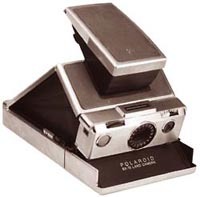 Does anyone know aht artists were give SX-70s by Polaroid when it first came out. I know Walker Evans was one of them -- but apparently there were more. I have a very good Polaroid 101 land camera. One owner and still is in great condition and take great pictures. It is a bout a 1966model. Can anyone tell me haow much it is worth.